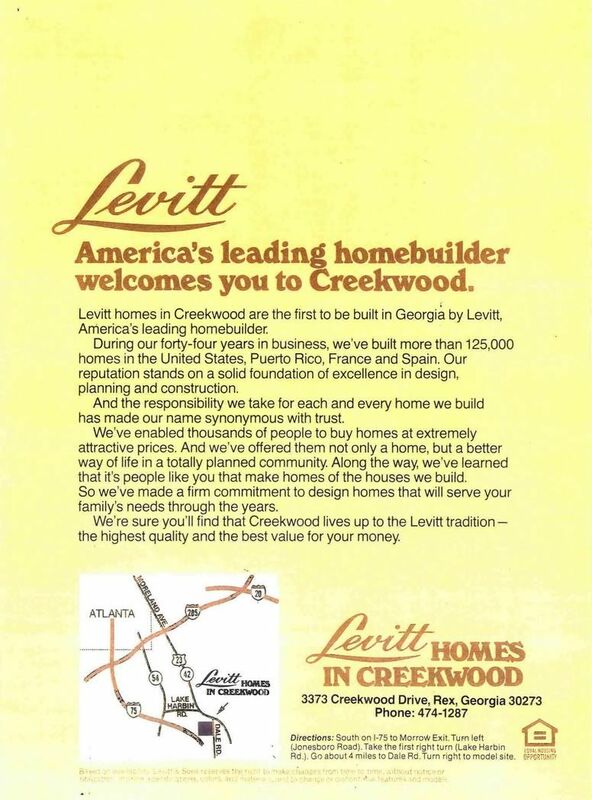 Creekwood is a planned residential subdivision, in which Levitt and Sons, Inc. was one of several builders over many years. Levitt Homes in Creekwood was Levitt's first of two projects in Georgia. product and housing value that is our hallmark," the statement added. At the same time, Levitt and Sons closed out its Willowbrook project in DeKalb County, in which only the four sample homes in the planned 128-home community were built. This period was not a good time for the homebuilding industry in general. R E X , G A . Location: Rex, Georgia in the Creekwood planned subdivision. Open for sales in 1973. Construction completed in 1974; full buildout not realized. Sample homes and Exhibit Center located on Creekwood Drive, with the Sales Office at 3373 Creekwood Drive. View the Levitt's Welcome Message and Company Introduction on the front and back of the attractive foldout brochure depicting the wood grain of a Georgia pine. View the Location Map showing area amenties near the Creekwood community's convenient location. View the Standard Features, listed beneath the Kensington plan on the foldout. Tour all three sample homes and select the style of your new Levitt Home in Creekwood. Variations on two models made popular in other Levitt communities plus one new home designed for Creekwood are available to suit your needs. Split-level. 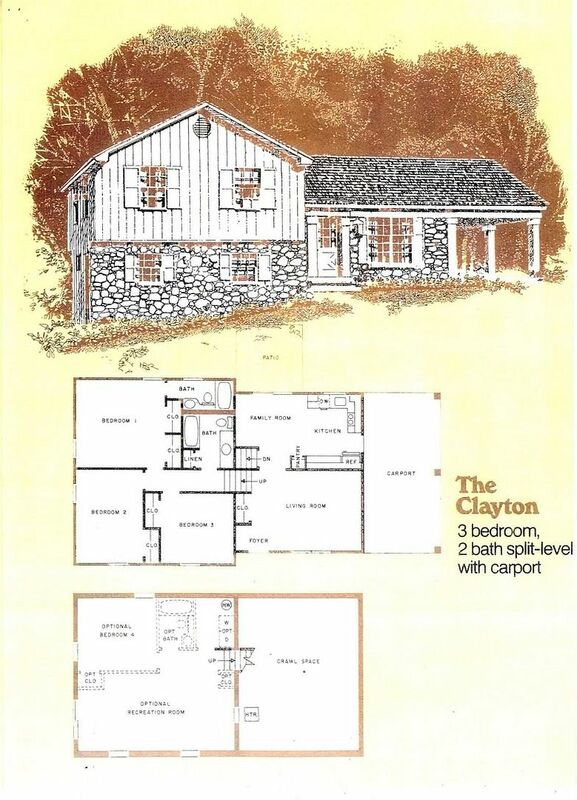 3 Bedrooms, 2 Baths, Living Room with Foyer Area, Kitchen-Family Room with Sliders to back patio and door to adjoining Carport, optional Finished Lower Level includes Recreation Room with Sliders to side lawn, Bedroom 4, Bath 3, and Laundry-Utility Room. Rancher. 3 Bedrooms, 2 Baths, Foyer, Formal Dining Room with Sliders to back patio, Kithcen with Breakfast Alcove, Separate Laundry-Utility Room with access to garage, 1-car Garage. Side-hall Colonial. 3 Bedrooms, 2-1/2 Baths, Foyer with Guest Closet and Laundry Area, Living Room with box window and optional Fireplace, Kitchen-Family Room, Master Suite with double-door entry and Walk-in Closet, Basement (optional Walk-out Condition on select homesites), Oversized 2-car Garage. Note the trend toward the elimination of the Formal Dining Room. Two of the models designate the space usually reserved for the Dining Room as a Family Room, eliminating the wall between this room and the Kitchen. 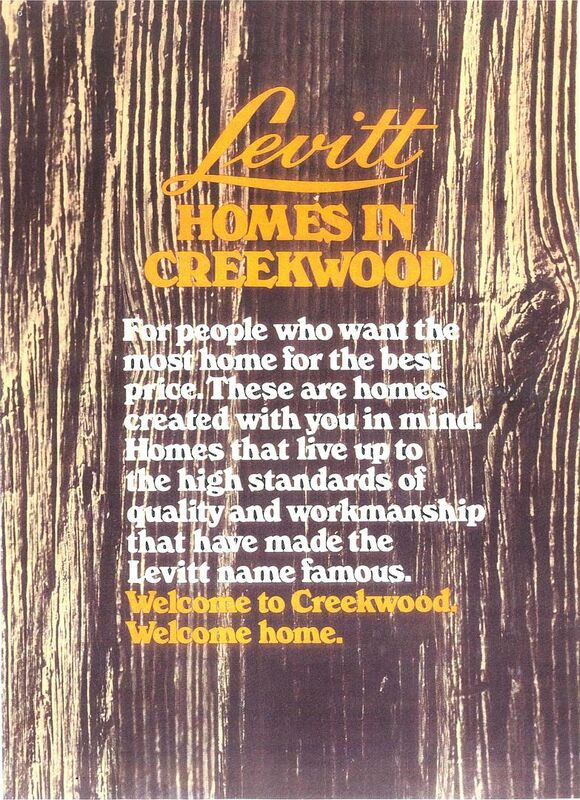 Levitt brought two home styles that were best sellers in other communities to Creekwood. The Kensington and Coventry were two homes that were already made popular in other Levitt communities--the Coventry in Belair Village at Bowie, Md., and the Kensington in several communities including Garfield Park East at Willingboro, N.J. Each was restyled on the exterior, and some modifications were made to the interior plan of the Coventry. The Kensington interior plan was identical to those built elsewhere. Despite the presence of two otherwise good sellers, the project was not successful due mostly to unforseen local and regional factors. Since the renderings for two of the homes are depicted on sloping lots with partial walk-out basements, it is likely that the community is situated on rolling terrain. 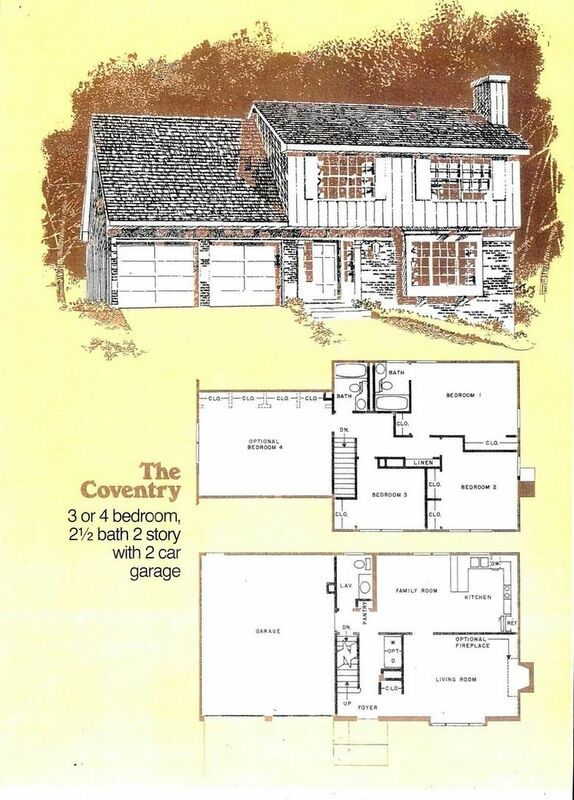 From careful examination of aerial photography, we believe that the Coventry was eventually offered with a one-car garage, presumably to boost sales while dropping the price, and possibly due to the perception of buyers that a two-car garage would be considered too lavish in a tight housing market. 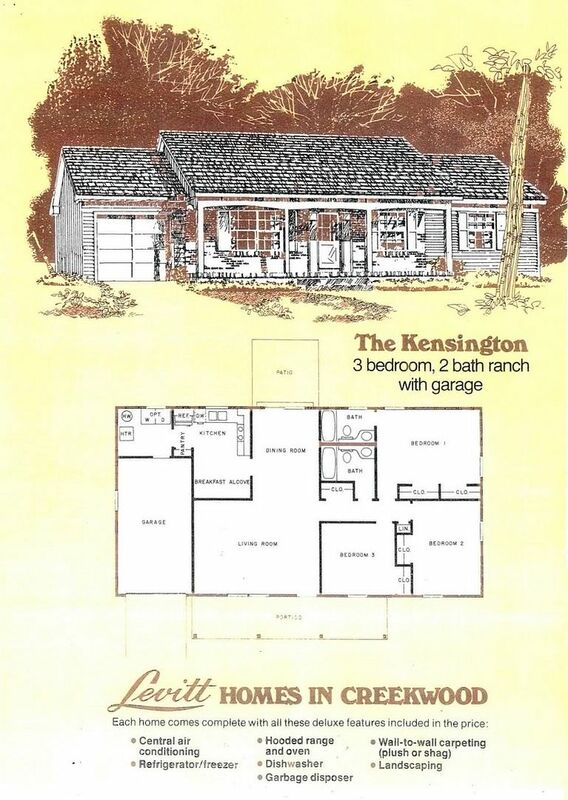 We also believe that the Kensington was offered with an alternate exterior elevation, with a front gable above the portico, similar to that offered in Garfield Park at Wilingboro. Note that the Washer and Dryer were not featured as standard equipment. Even for this time period, this was atypical of Levitt and Sons prior to the sale of the company to Starrett Housing Corporation. 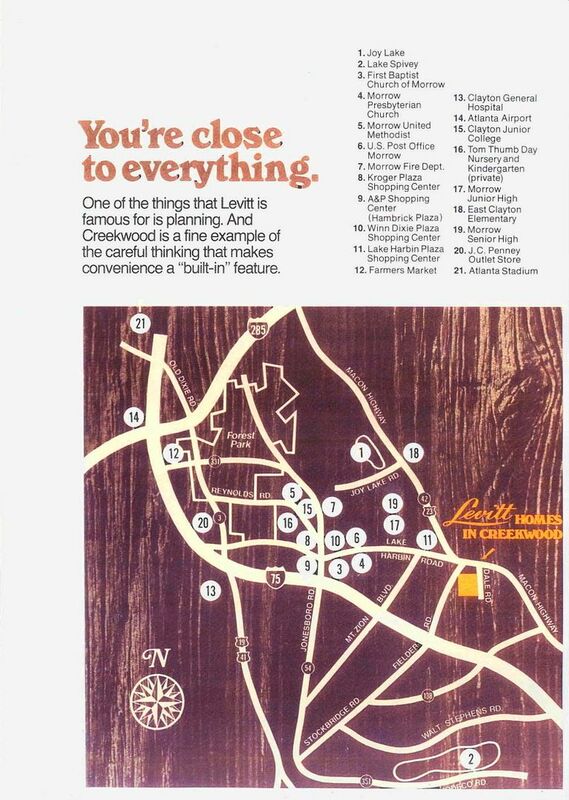 The Creekwood subdivision immediately surrounding the few Levitt homes that were constructed was eventually filled in by other builders in the 1980s.